This easy to make gluten-free recipe requires very little prep and is a healthier alternative to refined-grain options. Pre-heat oven according crust package directions. 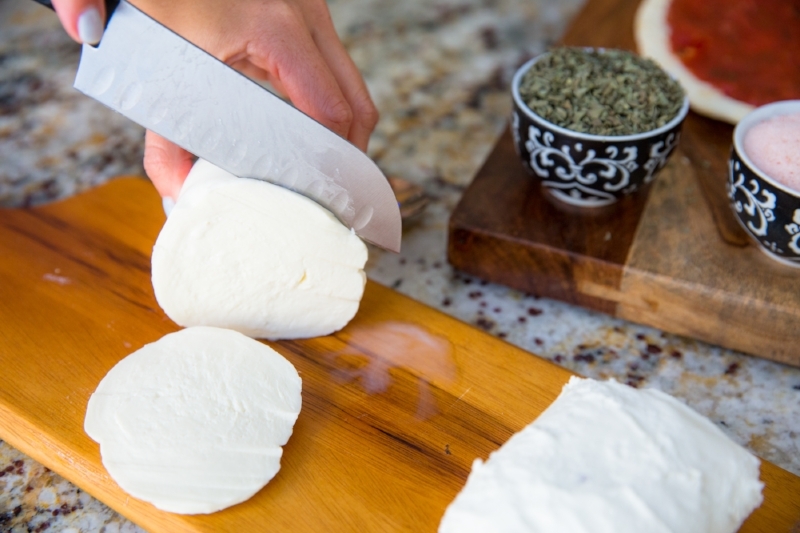 Shred mozzarella cheese or cut into rounds depending on how you like the cheese distributed and set aside in a bowl. 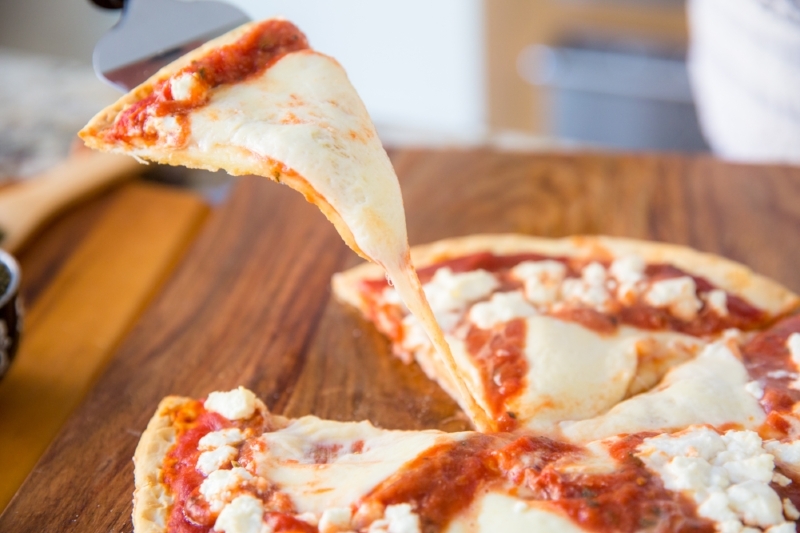 Distribute mozzarella evenly over tomato sauce. Sprinkle goat cheese over mozzarella. Cook pizza according to crust package directions. This is one of my favorite healthier takes on a turkey burger. Most buns are refined carbohydrates, offering very little nutritional value. Sweet potatoes, on the other hand, are packed with beneficial vitamins and minerals. 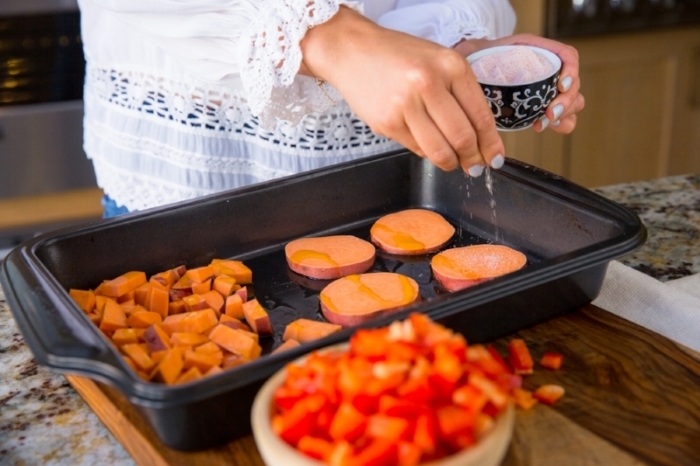 Orange Sweet potatoes are Vitamin A superstars (in the form of beta carotene), and are a good source of Vitamin C, manganese, niacin, Vitamin B1, 2 and 6, fiber, and potassium.The phytochemicals in sweet potatoes also keep us healthy by regulating the immune system. The benefits abound, which is why sweet potatoes get a big thumbs up from me. Preheat oven to 450. Wash and dry sweet potato and cut into 1/4 inch rounds. Chop the thinner ends into rectangular cubes to bake extra sweet potato fries on the side. Lay rounds and fries out on baking sheet, drizzle olive oil evenly over the top. roll the potatoes around in olive oil so all sides are covered. Sprinkle Salt and pepper over the top. Bake for 40-45 minutes. Cut red pepper into small squares and mix into turkey burger patties (about 2" diameter for each). Cook turkey burger patties over medium heat for about 15 minutes, flipping each side for a few minutes to cook evenly and thoroughly (until golden brown). Place each cooked burger between 2 sweet potato rounds, top with a teaspoon of ketchup if you'd like, and enjoy! I recommend consumption of an Omega-3 fatty fish 2 times a week as part of a healthy diet. Salmon is an easy and obvious choice. In addition to brain and heart-healthy Omega-3s, it's a great source of protein, B vitamins, selenium-- just to name a few of the nutrients. Several studies have found that eating more salmon helps reduce markers of inflammation in people at risk for certain chronic diseases. This recipe is just as tasty as it is good for you, and like most of my dinner recipes, it's very easy to make. Preheat the oven to 350°F. Line a baking sheet with parchment paper. In a medium bowl, combine the mayo and Sriracha. Add the salmon and mix gently with a fork. 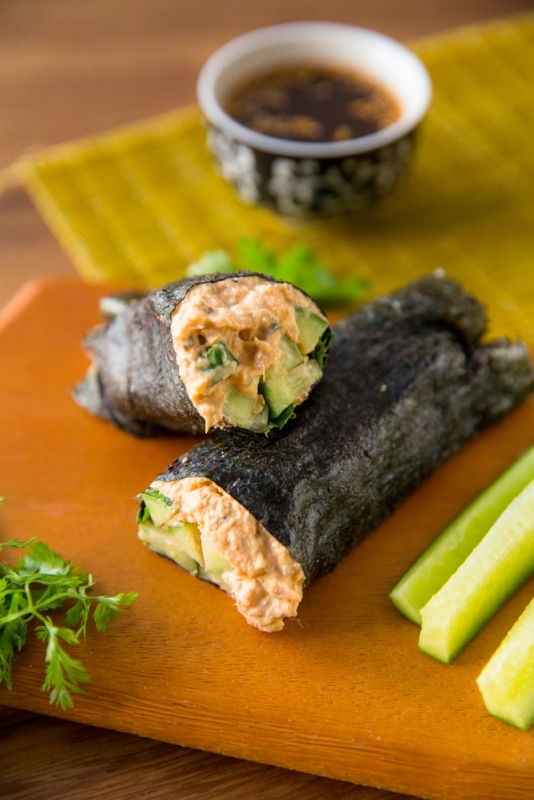 Layer the nori wraps with the avocado, cucumber, cilantro and jalapeno. Roll each into a burrito (ends tucked in) and cut in half. 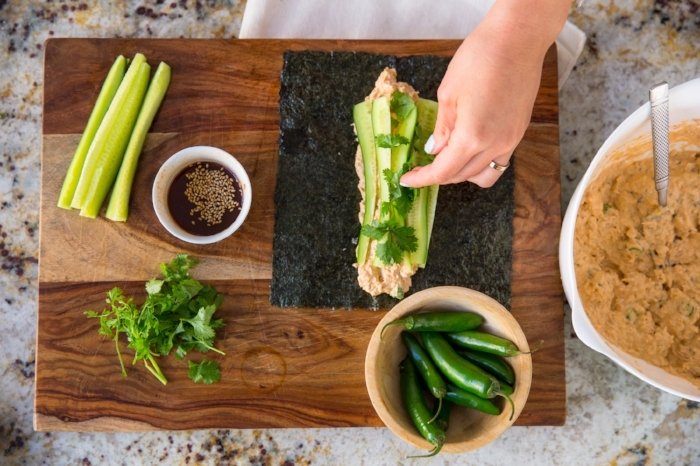 Garnish with the sesame seeds and serve with coconut aminos for dipping. Serve with a mixed green salad on the side to make it a Fit Fab Well complete meal! Mexican food is a staple in my home, and nachos have been a long time love. 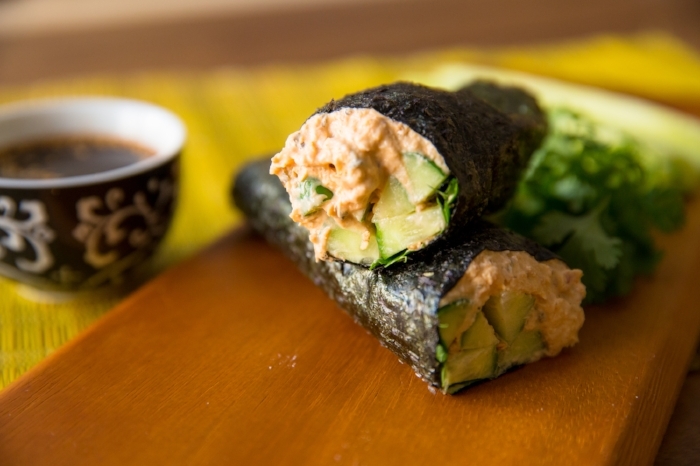 In my quest to find a healthy option to the typical cheesy, delicious snack/meal (which I still believe in occasionally indulging in), I got creative in the kitchen and came up with a recipe that not only tastes great, but is healthy, too. It is now a weekly meal for Taco Tuesday (or Wednesday or Thursday...), and I hope it becomes a crowd pleaser at your next party or family dinner time. Pre-heat oven 425 degrees. Spread Siete chips out evenly across a baking sheet. In a medium-size bowl, mix pre-shredded cabbage and mayo together until evenly mixed. Add Cabbage to the pan, spreading evenly across chips. Top with Ground Turkey crumbles (I like to pre-cook the turkey a bit on the stove beforehand but you can cook everything together). *Be sure to wash your hands after handling raw meat to avoid food borne-illness. Sprinkle goat cheese over all layers. Transfer baking sheet to the oven and cook for 30-35 minutes (make sure meat is cooked thoroughly. Divide amongst 4 plates and top with guacamole and salsa (optional). *Siete Chips are a great alternative to tortilla chips. My fave flavor is Lime. What I love about Siete chips is that they are grain free, which makes them gluten free too. They are made with real food ingredients: cassava flour (cassava is a root vegetable), avocado oil, coconut flour, ground chia seeds, sea salt, citric acid, and lime oil. They taste amazing, too! So light and mildly crispy. I'm not paid by the brand, just love to support those that align with my values. The fiber in oats and healthy fats in chia seeds and peanut butter help elongate your blood sugar curve, which keeps you full longer. This is because fiber and fat slow down digestion, which allows your body more time to absorb vital nutrients and vitamins it needs to perform all of its duties-- and help you feel amazing! Mix all ingredients together in a bowl (or mason jar) until combined. Refrigerate overnight in a mason jar with the lid on. Wake up. Eat! You can top it with bee pollen for added amino acid benefits (post workout it's especially important to help your muscles repair and rebuild tissue). I have a few go-to recipes for protein balls, but this is one of my faves. You can keep some of the nuts out of the recipe to add in during the rolling process for a little more crunch (as pictured to the left). This is a great snack an hour before a workout. I'll eat one or two before a cardio workout, or as an afternoon bridge snack to balance my blood sugar between lunch and dinner. They're so tasty! In a food processor blend dates, cashews, coconut oil and almond milk until well-mixed. Move to a bowl and mix in remaining ingredients until smooth. Roll into 1/4 inch balls, cover with coconut flakes, and place on a cookie sheet with parchment paper (you'll need 2 sheets). Store in the fridge for an hour. Eat! The first time I bought a bag of chia seeds at the store I looked at them disapprovingly. How was this little seed supposed to satiate me? What was I going to do with it? Since then I've blended it in 100's of smoothies, added it to snacks, desserts, and made my absolute fave pudding out of it. I'm not a big sweets person. As those close to me know, I would choose a plate of buffalo wings or bacon over cake any day. But I do love a good pudding. It's mostly a texture thing. I love the feeling of banana pudding on the tongue, and bread pudding. Tapioca pudding...also a fave. However, when navigating healthier options to these classic recipes, I discovered that chia seed pudding was the best solution all around. And now I eat it all the time. Not only does it taste delicious, it's also really good for you. Chia seeds are great nutritionally for a number of reasons. They're an excellent source of omega-3 fatty acids, which help raise HDL (the good) cholesterol that protects us against heart attack and stroke. They're also rich in antioxidants and provide fiber (4g in 1 TBSP), iron, and calcium. Toppings-- healthy fat like peanut butter, an antioxidant-rice fruit like blueberries, or a TBSP of molasses (optional). Keep toppings to a minimum. Add all ingredients to a mason jar and stir together until well mixed. Put the lid on and refrigerate for at least 4 hours. Best if refrigerated overnight. Serve and enjoy!